If energy reform ever comes to a vote in the Senate, passage will hinge on senators like Lisa Murkowski, the controversial, sometimes contradictory senior senator of Alaska. Murkowski sponsored legislation to curb climate change in 2007. But this year, she led the charge to limit the regulatory activities of the Environmental Protection Agency. She has taken hundreds of thousands of dollars in campaign contributions from energy interests, but her spokesman says she’s only representing her constituents. In these ways, Murkowski embodies the way that Washington’s crowded table of bills, lobbyists and special interests can complicate efforts to reform the nation’s energy policies. Murkowski began her contentious career in national politics in 2002 when Frank Murkowski, her father and then-Alaskan governor, appointed her to the Senate seat he had just vacated. In 2004, voters passed an anti-nepotism ballot initiative that stripped the Alaskan governor of the power to appoint senators. But in the same election, Murkowski narrowly defeated challenger Tony Knowles to win her first full term to the Senate. Murkowski’s success at the ballot box may be, in part, a result of her commitment to Alaska’s top job supplier and revenue maker — energy. Her ties to Alaska’s energy industry, especially to oil, run deep. Fourteen of her top 22 contributors, representing more than $250,000 in donations in the last five years, have energy or oil ties, according to the Center for Responsive Politics. They include corporations such as Exxon Mobil, Southern Company and Duke Energy. Murkowski’s connections have led some to cast her as an example of how much influence special interests and big money hold over politicians. But Jennifer Duffy, senior editor for the Cook Political Report, said that it’s unfair to cast Murkowski as a puppet of the energy industry. Excluding federal offshore production, Alaska is second only to Texas in national crude-oil production, according to the U.S. Energy Information Administration. The Alaska North Slope is home to 14 of the 100 largest oil fields in the U.S., and its Prudhoe Bay is the largest oil field in the country. Economist Neal Fried reported in September 2008’s Alaska Economic Trends that oil and gas compose the largest percentage — 29 percent — of Alaska’s gross state product. In 2007, the oil industry’s payroll accounted for 9 percent of all state wages and salaries, totaling $1.3 billion. The revenue from Alaska’s oil enables the state to avoid charging sales tax and individual income tax. Meanwhile, state citizens receive dividend checks from the Alaska Permanent Fund, an oil-royalties deposit account. Murkowski has made it clear that she will defend energy interests in recent debates about national energy policy. She introduced an amendment in the Senate in January 2010 that would have temporarily halted the EPA’s regulation of greenhouse-gas emissions under the Clean Air Act. The senator could not be reached for comment. But Pete Andrews, professor of environmental policy at the University of North Carolina at Chapel Hill, said defenders of the EPA’s role often cite the agency’s narrow scope as a reason it should regulate pollutants. EPA Administrator Lisa Jackson wrote that Murkowski’s amendment would weaken the nation’s efforts to cut oil consumption and greenhouse-gas emissions. “The resolution would ignore and override scientific findings and allow big oil companies, big refineries and others to continue to pollute without any oversight or consequence,” she said in an op-ed published on the Huffington Post’s website. Strailey of the Alaska Center for the Environment said he believes Murkowski introduced the EPA measure as political hedge in an election year that has seen her Republican opponent, Fairbanks lawyer Joe Miller, capture the endorsement of Sarah Palin and the Tea Party movement. “I think in a lot of ways, she’s looking at the election,” Strailey said, adding that he thinks she’s trying to reasonably respond to constituent and industry fear that EPA regulations may hinder the prospects of the oil and gas industries. In June, Murkowski’s amendment was defeated, 53-47. Republicans voted unanimously in favor of the measure, joined by six Democrats from energy-producing states. But Tim Profeta, director of the Nicholas Institute for Environmental Policy Solutions at Duke University, said that the amendment’s passage would have been a pyrrhic victory. Murkowski is not alone in having energy ties. President Barack Obama, too, has energy connections. The Center for Responsive politics reports that the president is the all-time top recipient of money from BP employees, having received $77,000 in personal donations. Cutler Cleveland, director of Boston University’s Center for Energy and Environmental Studies, said that having so many interests at play results in energy legislation that tries to please too many and do too much. Consumers, he said, are interested in low and stable energy prices. Producers are more interested in promoting their own fuel. Then there are policy-makers, such as Murkowski, who have complex political interests of their own. Oil and gas lobbies have traditionally held the lead in shaping the government’s energy policy, spending hundreds of millions of dollars to influence Congress. But a newfound political interest in alternative energy saw this sector’s advocacy efforts skyrocket during the debates on the current legislation. The energy industry ranks fifth for lobbying contributions, behind areas such as finance and health. Top contributors in this business sector have historically been multinational, fossil-fuel companies that directed the majority of their funds toward Republicans. For example, oil and gas companies have spent almost $250 million in lobbying since 1990, two-thirds of which was given to Republicans. Petroleum-focused businesses such as Koch, Exxon and Chevron are still the top lobbyists in this sector, but alternative energy interests have increased their spending exponentially over the past decade. Since 1998, this sector increased its lobbying expenses more than tenfold. The Obama administration and Democratic majority in Congress marked a noticeable shift toward a diversified energy portfolio, triggering a rapid growth of alternative energy businesses. Consequently, this sector stepped up its lobbying efforts to secure favorable legislation. Alternative energy lobbies are not just asking for a cap on carbon, but also for economic measures such as incentives, tax credits and subsidies. 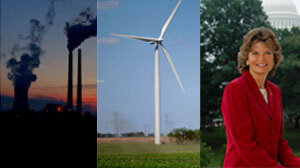 The wind industry, in particular, set record growth rates within the alternative energy sector. Since 2000, wind-generated electricity increased more than tenfold. This growth spurred the industry’s lobbying activities. Over the past two years, the American Wind Energy Association, a national trade association enlisting more than 2,300 wind-related constituents, recorded the highest lobbying expenditures. The ratification of the American Clean Energy and Security Act (also known as the Climate and Energy Bill) by the House in June 2009, gave hope to the whole alternative energy sector’s advocacy efforts. But AWEA staff declined to comment on the success of its specific lobbying activities. The alternative energy industry remains active on Capitol Hill, advocating for legislative measures that would sustain its recent growth. John Walke has worked with or against the Environmental Protection Agency every day for the past 10 years. As senior attorney and director of the Natural Resource Defense Council’s Clean Air program, he challenged the EPA’s actions under the Bush administration, which failed to protect the public from hazardous air pollutants, including greenhouse gases. Earlier this year, Congress seemed ready to curb greenhouse gases when Sens. Kerry and Lieberman introduced the American Power Act. But with little Republican support and key Democrats wavering, the bill appears to be stalled, at least for this Congressional year. With climate legislation idle in Congress, political leaders are considering whether the states and the EPA will continue to take the lead in regulating greenhouse gases. “Kerry-Lieberman is a moot point now,” said Bill Becker, executive director of the National Association of Clean Air Agencies. The stalling of the bill counters the emphasis placed by the Obama administration and Democratic leaders in Congress on passing both climate and energy legislation this year. “The difference between the Obama administration and the Bush administration is like the difference between day and nightmare,” Walke said. He said that unlike the Bush administration, which only encouraged greenhouse gas reductions through voluntary action, the Obama administration fundamentally believes in using legislative power to reduce emissions. Walke now thinks that the EPA may be more important than ever in the fight to reduce greenhouse gases. After almost 50 years since the initial passing of the Clean Air Act, the EPA is finally poised to regulate greenhouse gases nationwide. Until this point, greenhouse gas emission standards have been set on the state and municipal levels. In 2007, the Supreme Court ruled in the landmark case Massachusetts v. EPA that greenhouse gases are air pollutants, which led the EPA to officially determine that greenhouse gases endanger the public. Under the court ruling, the EPA must regulate greenhouse gases. The agency can begin regulation in early 2011. First, the agency will reduce greenhouse gases from cars and trucks, and eventually power plants and factories. But there are signs that the EPA will face political obstacles. “I think there will continue to be efforts to strip or delay EPA’s authority,” Walke said. Already, Sen. Murkowsi (R-AK) has challenged the EPA’s authority to regulate greenhouse gases, citing economic concerns. For now, states and cities retain the authority to set their own emission standards. Becker sees that as an important tool in fighting climate change. Meanwhile, he worries that if climate legislation clears Congress, it will be too weak to protect the public. “Maybe it’s better that Congress is dysfunctional in passing legislation and maybe we should let the EPA keep going,” he added. But Walke said he will continue to push for federal legislation. “State and local action is not enough, and no one at those levels pretends that it is enough,” Walke said. He said that regional efforts such as the Regional Greenhouse Gas Initiative in New England and the Western Climate Initiative on the West Coast put them ahead of the rest of the country, but federal legislation is still necessary. “They’re not enough to solve the problem, and their officials would be the first to admit it,” Walke added. While waiting for federal legislation, Walke said he will fight the EPA to ensure they enact GHG regulations as they are now legally bound to do. “I’m an optimist and hope Congress will come to its senses,” he said.